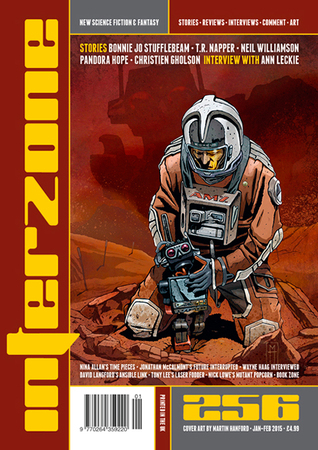 Interzone is a long-running UK magazine dedicated to science fiction and fantasy, and each issue is filled with commentary, reviews and short stories from around the world that tend towards the literary end of the spectrum. A long-standing tradition of the magazine has been to invite its readers to vote for the stories it has published during the previous year. Readers can vote positively or negatively, however they see fit. Noah Wahid seeks asylum in the UK but he is finding the Border Agency painfully slow to deal with. He is a passionate man whose fire is frequently stoked by those who add nothing to society, whether they’re a jeering pack of feral youths or a filthy bag lady. Nobody he meets seems to appreciate what they have, especially when compared to the chaos and violence he has fled, and all the while his mind is tormented by glimpses of his love, his muse, his demon, Marielena. She taunts him for running away, she mocks his newfound pauper’s existence, she fuels the growing anger and frustration he feels inside. But then Noah learns that not everyone he meets is a perfect fit for his prejudices, and discovers there are some among us who are just as alien to their situation as he. A reliable indicator of a good story is a count of how often one checks their progress while reading it. I don’t recall doing this at all while reading Marielena, it’s that good. The writing is excellent, but then fans of Nina Allan’s work already know that. Noah Wahid is a wonderfully complex character. He is an eloquent, well-read man who has fled a regime intolerant of intellectuals, and the reader gets a real flavour of his plight. Noah’s arc (sorry) is also perfectly judged, with the reader rooting for him one moment and finding their sympathies tested the next. I found Marielena a fine counterpoint to the island mentality that pervades the UK and the current heat of Islamophobia we find rippling across media outlets the world over, and it is my standout read of Interzone’s 2014. A man visits his father in a care home and is reminded of happier times when he was a boy and his father was a UFO obsessive, going so far as to build a comically simple detector in his closet. His father would stand by the telescope he had built in the back yard, not looking through it but straight up into the stars. There was never any doubt in his father’s mind that UFOs existed, but now that mind is being cruelly eaten away by Alzheimer’s. When the man takes his father for his next doctor’s appointment, he makes a fateful decision to stop by the old family home. I really liked this story. Up to a point My Father… can be read as an affective meditation on how all fantasy eventually succumbs to reality. You might read a novel, but then you’ll eventually put it down. You might meet a Martian Moon Maid at the Cinderella City mall, but eventually she will clock off her shift and go home. You might become lost to Alzheimer’s but even then something very real and final will release you from it. As the story alternates between past and present, we therefore witness real life overtaking the fantasy worlds of both the boy and his father at much the same time, and, when this happens, how soon they then drift apart. I especially liked the ambiguous ending of this story, and how, by turns, it can be seen as a happy outcome or an equally alarming one. This is a story that somewhat belies its daft-sounding title, and one I would very much recommended you check out. Neil is handed a small box containing the ashes of Lucia, his former partner, and is immediately reminded of their adventures together. They would travel the war-ravaged world, seeking abandoned new-tech sites created by rapidly-advancing AIs, trying to figure out what they were building and why. The AIs responsible had all disappeared, each of them reaching a stage in their development sufficient for them to suddenly “wink out”. When Neil learns of a new-tech site in which Lucia had grown interested before falling ill, he knows he has found an appropriate location to scatter her ashes. I’ve chosen Ashes for the sheer number of ideas fizzing beneath the story’s surface. It’s an excellent example of unobtrusive world-building. In the space of 5,300 words not only do we have Lucia’s wake and Neil’s journey to scatter her ashes, but also a history of the AIs and how they helped the human race destroy themselves, an interesting philosophical debate as the remaining AIs attempt to discuss “winking out” without doing so themselves, a believable world littered with new-tech sites and the mysteries surrounding them, and so on and so forth. It all made Ashes a really entertaining read. Some way into the distant future Fari blasts asteroids for a living for the Baselle Mining Corp, a deeply-religious company that values women far less than they do men. She excels at her job, mixing it with her male colleagues with consummate ease, earning their respect if only a fraction of their wages. Indeed she is one of the best slaves… er… employees of the Corp, which poses an awkward anomaly for the new hard-line Rep in town. When the Rep takes it upon himself to push Fari’s buttons, Fari pushes back and then some. Another from Interzone 251 (2014’s strongest issue by a distance) Fly Away Home is a straight story that engenders some complex emotions in its readers. Baselle is an amalgam of many existing cultures that routinely piss on women’s rights, but it’s this hesitancy to single out a particular culture that stops me just short of calling Fly Away Home an important work. (Of course, given the number of brainwashed lunatics we are led to believe walk in our midst, this is perhaps understandable.) Nonetheless it is a great and thought-provoking read and well worth checking out. Laura Harrison works for an interplanetary company called Serberus, a company fighting a bitter war against a rival called Callitrix. Laura is a level two employee working on the third floor. She drinks Serberwater, eats Serberus Low Cal meals and tows the Serberus line. When she is called up to the eleventh floor she is nervous. Few people return from the eleventh floor. Once there she is instructed by Doctor Thrum to lose a few pounds with the help of a diet pill called Serberitum. When she does her life is transformed. She now works for Callitrix on the thirteenth floor. Or does she? And what’s the deal with her neighbour Phil? Why is he looking after an identical copy of himself? I don’t normally seek out stories that take the reader down the rabbit hole, but there was a playfulness I really enjoyed about Wake Up, Phil as Laura found herself flip-flopping between Serberus and Callitrix. The story also makes a pleasing and subtle dig at the march of globalisation in depicting a future where war is fought by companies, not countries. This is a fun story that’s definitely worth a read. The following stories also tickled my sci-fi fancy, and are worth checking out. Predvestniki by Greg Kurzawa (Interzone 250); Ghost Story by John Grant, Old Bones by Greg Kurzawa (both Interzone 251); The Posset Pot by Neil Williamson, A Brief Light by Claire Humphrey (both Interzone 252); The Bars of Orion by Caren Gussoff; The Golden Nose by Neil Williamson (both Interzone 253); A Minute and a Half by Jay O’Connell; Dark on a Darkling Earth by T. R. Napper (both Interzone 254); Must Supply Own Work Boots by Malcolm Devlin; The Calling of Night’s Ocean by Thana Niveau; Finding Waltzer Three by Tim Major; Mind the Gap by Jennifer Dornan-Fish (all Interzone 255). I wouldn’t be so mean as to mark down any particular story. They were all clearly good enough to appeal to someone, after all, and Interzone would be a poorer magazine if it published the same kinds of story over and over again. That said, there were stories here that won’t sway me from my reading prejudices any time soon. Stream of consciousness still makes me want to chew out my eyeballs, and I have yet to read a story that has been successfully written in the second person. Maybe in 2015? Maybe. So those are my picks for the Interzone 2014 reader’s poll. If you aren’t familiar with the magazine then I hope to have given you a flavour of the kinds of stories you can expect to find inside. It’ll be interesting to see how close (if at all!) my choices match the magazine’s wider readership.